IN A phenomenal reversal for Las Vegas in its 20-year quest for water from the Great Basin Aquifer, the Southern Nevada Water Authority has been stripped of rights to 18,755 acre feet of water a year, or enough for more than 37,000 homes, which it had been allocated from three key basins. The Las Vegas Review-Journal reports today that Nevada District judge Norman C. Robison has ruled that the State Engineer “acted arbitrarily, capriciously and oppressively” when he cleared the authority to pump more than 6 billion gallons of groundwater a year from Cave, Delamar and Dry Lake valleys. Above and beyond the amount of water involved, this is a crippling strategic blow to the authority. Located in neighboring Lincoln County, Cave, Dry Lake and Delamar valleys are critical first sites* for the proposed well-fields that will feed what Las Vegas envisions as a nearly 300-mile-long pipeline to eventually be run north to the foot of the Great Basin National Park. 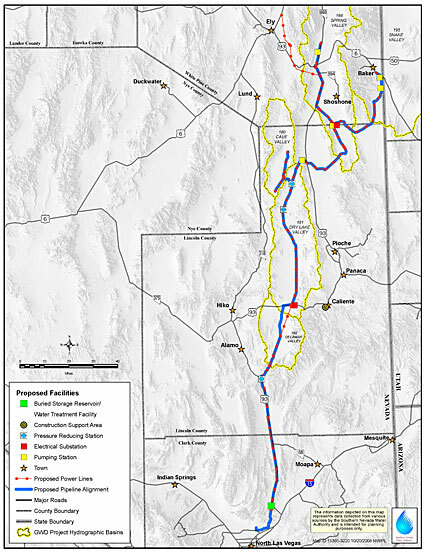 Inability to pump these three relatively local valleys pending an appeal will mean that Las Vegas would have to drive its pipeline through Lincoln County into farther flung White Pine County to begin tapping permitted supplies from Spring Valley. But even these northern supplies for Las Vegas are in jeopardy as Utah studies potential impacts that the Las Vegas project may have in Snake Valley, a basin adjacent to Spring Valley and shared by both Nevada and the Beehive state. As studies progress, water from Snake Valley may not be awarded until 2019, leaving total northern yields uncertain for investors in the $3.5bn Las Vegas pipeline. … Robison ruled that State Engineer Tracy Taylor “abused his discretion” and “acted arbitrarily, capriciously and oppressively” when he cleared the authority to pump more than 6 billion gallons of groundwater a year from Cave, Delamar and Dry Lake valleys. Meanwhile, from Reno, Susan Lynn of the Great Basin Water Network, one of the groups that filed the 2008 suit ruled on by Robison challenging the Nevada State Engineer’s Cave, Dry and Delamar decision, said this morning that they only heard of their victory by chance. One of their members, White Pine County rancher Dean Baker, was speaking yesterday to an Utahan official, who happened to have a copy of the ruling. Had he heard about the ruling, the official asked Baker. What ruling? Baker replied. Baker’s last two decades have been spent fighting the pipeline. According to Lynn, even the attorney representing the Great Basin Water Network in the case, Simeon Herskovits of the New Mexican law firm Advocates for Community and Environment, had heard nothing of his victory until yesterday when at a Reno meeting a Nevadan attorney sidled up to congratulate him. Lynn suspects that her group’s copy of the ruling may have been lost in the post. Fittingly enough, the proposed route for the Las Vegas pipeline follows old pony express routes throughout Nevada. **The Las Vegas Sun reports that Judge Robison’s ruling is being studied by the Nevada Department of Conservation and Natural Resources, which oversees the State Engineer‘s office. Click here for an Associated Press report from the San Francisco Chronicle. *For a look at where Cave, Dry Lake and Delamar valleys fit into the over-all pumping strategy behind the pipeline, click here to read a memo from the SNWA’s former hydrologists Terry Katzer and Timothy Durbin. According to Durbin, the memo was written when he and Katzer became worried by assurances to the public by the SNWA general manager Patricia Mulroy that the project would have minimal damage on the environment. They wanted to register the pumping strategy in writing with the authority lawyer, Paul Taggart, before entering into a series of hearings before the State Engineer of Nevada over the water rights in the valleys involved in the plan. Durbin’s discomfort with the way the potential impacts were portrayed before the State Engineer led to him releasing this memo and appearing for the protestants to the SNWA pipeline in the Cave, Dry Lake and Delamar valley hearings. For background on the how Timothy Durbin blew the whistle on SNWA for suppressing impact studies before the State Engineer, and how SNWA moved to discredit his claims during the hearing, click here. This post has been updated. Last update 10/30/2009, 12.08pm. Great post — really excellent! The reek of corruption emanating from Nevada these days is overwhelming. Well, what else is new? Deceit is the fuel of its economic engines. The strategy proposed in the Durbin/Katzer memo in which SNWA would pump for a limited time from the ‘dry’ valleys is technically feasible. One could probably pump a substantial quantity of water from the dry valleys, especially if one was careful to restrict the pumping to the alluvium, as Durbin/Katzer suggest, for a period of perhaps 50 years, or longer. There would be no discernable impact on the discharge of interest from the Carbonate Aquifer, especially the major springs.. Pumping would have to be stopped after this period, and the system allowed to recover–as Durbin/Katzer suggest. However, there is no indication that SNWA adopted this strategy. Their applications for permits in Cave, Dry Lake, Delamar valleys were for typical permits that allowed for perpetual pumping. I saw no indication of a proposal to pump for a finite period. The Durbin/Katzer strategy is a scheme to mine a quantity of water (remove from groundwater storage) without having a measureable, down gradient impact. As I suggested above, it is a workable strategy if done carefully; but it does not fit within the framework of Nevada Water Law–at least as I understand it. If the Durbin/Katzer strategy is the operable strategy of SNWA, one would think they would have to be open in selling the idea.